If you’re heading to Pack Expo researching a project or looking for new technologies/applications with conveyors, make sure to stop by and see how we can help you tackle your challenges. For starters, we can build a conveyor system to your exact specifications. Need one that’s 13 feet, one inch long, with a width of 14 and a half inches wide? We can do that and have it delivered in as few as three days. We don’t need to remind you that having a conveyor system made to your specifications, and operating in your facility on time is important. Second, our wide breadth of pre-engineered product can handle virtually all your material handling needs. 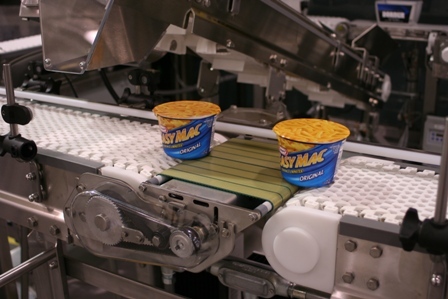 We build conveyor systems specifically designed for packaging, sanitary, industrial, and automation applications. Of course, dealing with just one reputable supplier, like Dorner, for all your conveyor needs is convenient and a great time saver. Thirdly, our service is second to none. We offer on-site training for your employees to ensure proper installation, review safety features and discuss preventative maintenance tips. We’ll help you improve efficiency and increase conveyor up-time. While at Pack Expo, be sure to stop by booth No. 3308 – and see for yourself the Dorner advantage.